You are here: Home/FREE Homeschooling Resources/Subscriber Only Freebies/America’s Federal Holidays, The True Story – FREE for a limited time! 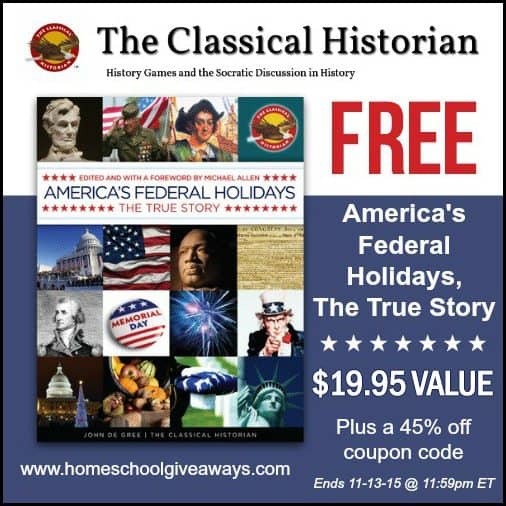 America’s Federal Holidays, The True Story – FREE for a limited time! Just in time for Veteran’s Day! Do your children ask you what certain holidays mean and where they come from? Do you know how to answer them? I don’t always know, I admit. This high quality book has lessons for all of the Federal Holidays and questions and answers for each one along with a research section for older students. I am delighted to have this and plan on studying about each holiday before it arrives. You will LOVE this!! This week we have a great FREEBIE for you from The Classical Historian! 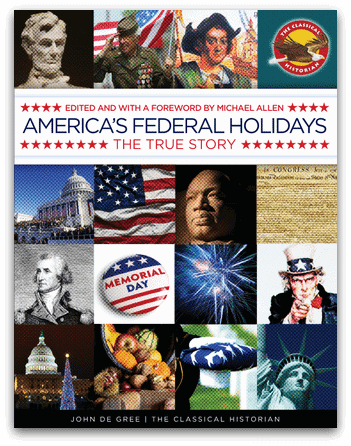 Get America’s Federal Holidays, The True Story for FREE. This is a $19.95 value! Teach the truth of our country’s heroes and traditions! Written by a veteran classroom teacher and homeschool Dad, this is a practical source for children and students of all ages. America’s Federal Holidays is a trusted source to teach history and patriotism and is a challenge to revisionist historians who ignore the greatness and exceptionalism of the United States of America. Click here to learn more about this book and see a sample. Scroll down and enter your email for an instant download. You get 6 History Games and American History Flash Cards for One Great Price! $69.99 ONLY $38.49 with coupon code Homeschoolgiveaway – what an awesome Christmas present for a homeschool family!